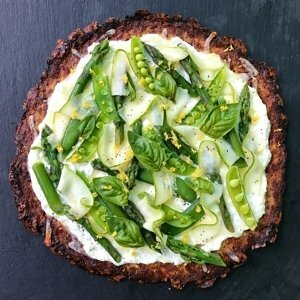 Cali’flour Foods Cauliflower Crust topped with creamy ricotta, crispy blanched snap peas and asparagus, lemony zucchini ribbons and fresh basil. So fresh and yummy, it tastes like summer. Toppings inspo and recipe from Cooking Light. And it couldn’t be easier using Cali’Flour Foods Cauliflower Pizza Crust. We are big fans of Cali’flour Foods pizza crusts. If you haven’t tried them, it is a must! Great taste, great texture and such a time saver. It is the real deal… made with only a few ingredients and tastes homemade. They have 3 varieties — an Original Italian Cauliflower Crust, Sweet Red Pepper Cauliflower Crust and a Plant-Based Italian Cauliflower Crust. We love that it’s naturally gluten-free and is also a great way to get in some extra veggies. A easy, fresh and delicious pizza that tastes like summer! And it is surprisingly quick and easy to make using Cali'flour Foods cauliflower pizza crusts. Original post (8/2017) sponsored in partnership with Cali'Flour Foods. Pizza toppings inspiration and recipe adapted from Cooking Light. PrebakeCali'flour Foods Pizza according to package. Meanwhile blanch asparagus and snap peas: bring a large pot of water to a boil. Add asparagus and snap peas, cook 2 minutes, then drain in a colander and submerge into ice water. Drain again, pat dry and set aside. Combine ricotta, milk, and garlic in a small bowl. Spread mixture over prepared Cali'Flour crust, leaving a ½-inch border. Top with mozzarella, asparagus, and snap peas. Bake at 375°F for 8-10 minutes. While pizza bakes, toss zucchini with lemon juice and salt. After removing pizza from over, top with zucchini mixture, lemon zest, basil, and black pepper.